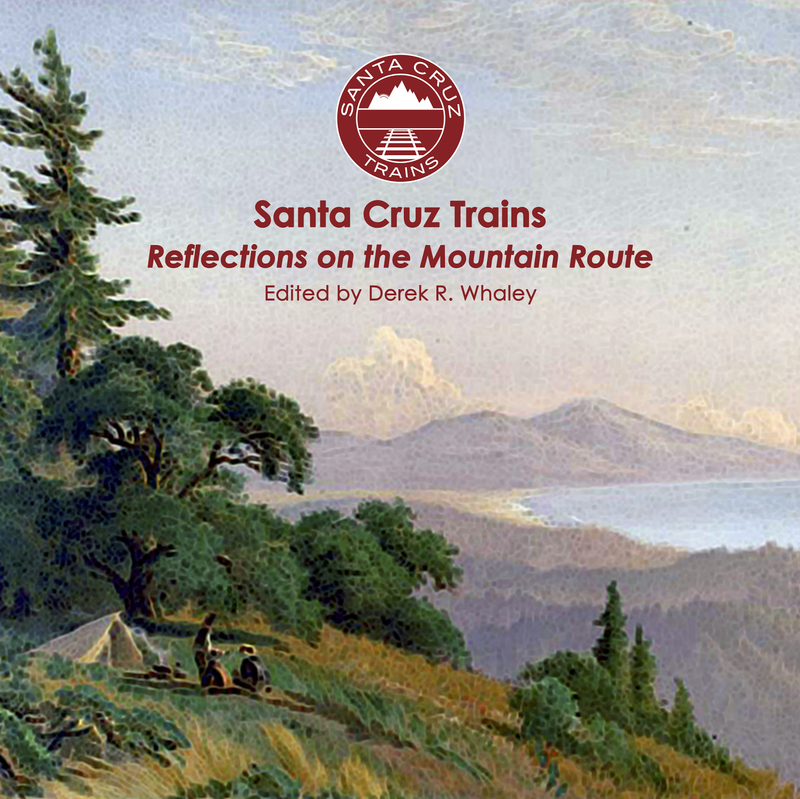 Railroading in the Santa Cruz Mountains was always dominated by the lumber trade. From 1875 until 1922, the lumber industry commanded every single local railroad branch line. 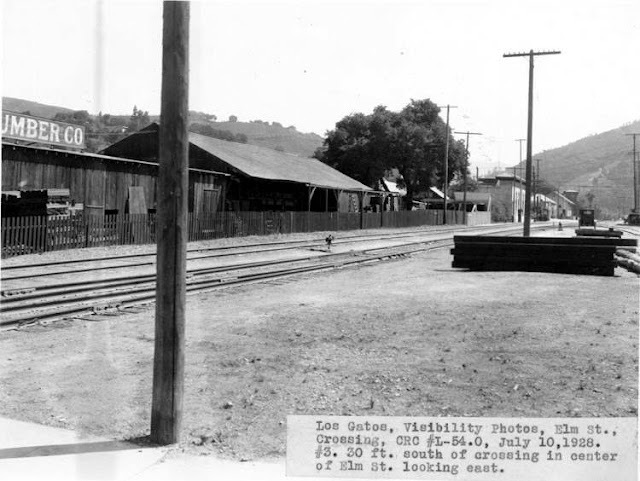 But even after the route over the mountains was demolished in 1940, lumber remained important to the town of Los Gatos. Los Gatos was essentially founded as a lumber town. 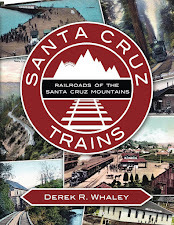 The spiritual successor to Lexington, located a few miles south in the Los Gatos Creek valley, the town was founded partially as a location to ship lumber collected in the Santa Cruz Mountains from towns such as Glenwood and Laurel. As such, a lumber yard was needed and a rather large one arose on both sides of the tracks along Elm Street, possibly as early as 1878. This yard was owned by the Santa Clara Valley Mill & Lumber Company, founded by the Dougherty brothers, who harvested vast tracts of land in the San Lorenzo Valley and Los Gatos Creek region. They shipped all of their finished lumber over the South Pacific Coast Railroad line, which formally opened through Los Gatos in May 1880 (although tracks to Los Gatos were in place by late 1877). The Dougherty firm operated largely through partnerships and their Los Gatos operators were no different. Their partner there was the Lindon & Silverton Lumber Company, which moved into the lot no later than 1888 and opened a box factory and planing mill. The box factory and planing mill were built immediately west of the railroad right-of-way through Los Gatos with an attached barley and grain mill. Goods were loaded directly onto boxcars waiting on the main track. A large lumber yard sat along a spur west of the fruit packing spur where awaiting lumber could be loaded onto freight cars. By 1891, the planing mill was open, though all signs of the barley and grain mill disappeared. The lumber yard moved to a more convenient home east of the mainline along a new spur built specifically for the yard and planing mill. When the line was standard-gauged in 1903, the spur was extended further north. 310,000 board feet of lumber could be stored alongside the track here. The planing mill was seasonally open. A second mill owned by Tice and Gregory was just across Mullen Street, though there was no spur supporting this smaller facility. In 1895, the facility passed into the hands of the Western Mill & Lumber Company, which slightly enlarged the mill and gave up on box-making. The vast lumber yards across the tracks were expanded to support more lumber and a second small lumber yard was placed just beside the engine house to the west of the main line. The planning mill did not last long. By the time the route was standard-gauged in 1903, the mill was gone. Sanborn maps dating from 1905 and afterwards show the new turntable and roundhouse sitting on the site of the mill. 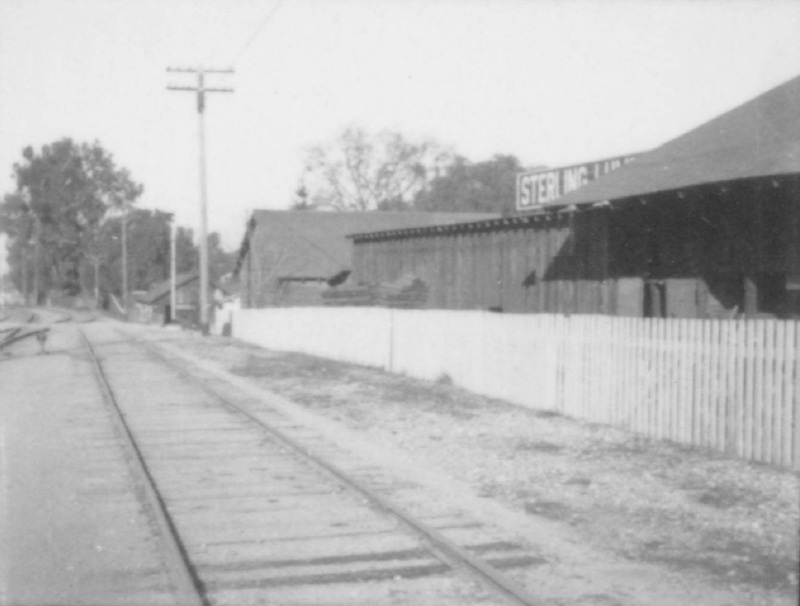 The lumber yard remained on the west side of the tracks and the spur was enlarged into a longer siding that lasted until the end of the line in 1959. In 1918, the Noah Adams Lumber Company purchased the property. Adams was certainly established by 1900 and quite likely earlier, although it was based out of Oakland, not Los Gatos initially. By the late 1910s, the Adams firm had purchased a number of lumber mills including ones in Auburn, Winters, San Lorenzo, and elsewhere in Central California. Although they remained in business until at least 1944, their Los Gatos facility was sold to the Sterling Lumber Company in 1922 for unspecified reasons. The Sterling Lumber Company was founded in late 1906 following the San Francisco Earthquake in Berkeley. Over the following years, the company made a habit of buying out small lumbering concerns across the West Coast, including in Oregon. Their main base, though, was always in the Bay Area, with offices and yards erected situated in San Francisco, Mountain View, Los Gatos, Salinas, Oakland, and elsewhere, totalling sixteen properties in California by 1927. Unfortunately, the origins of the company name are unknown and appear to be unconnected to the founders of the corporation. 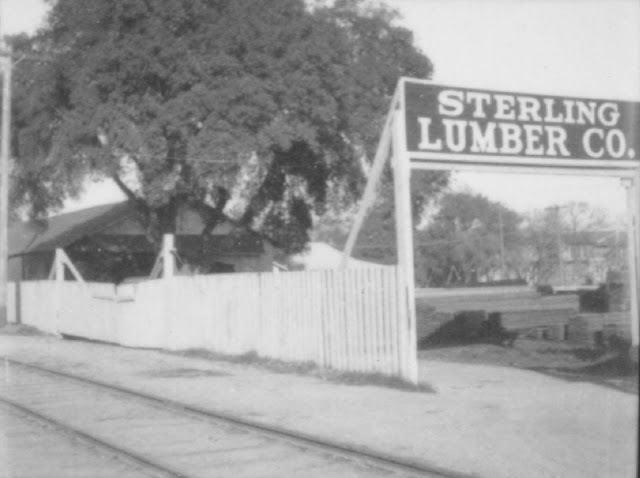 Due to the numerous photographs from the time and the fact that it survived into the 1950s, the Sterling Lumber Company is probably the best-remembered firm to use this large lot in downtown Los Gatos. Southern Pacific Railroad visibility photographs in the 1920s and 1930s prominently show the lumber yard alongside the tracks. The company loaded lumber onto cars that were parked on a team track (spur) that sat across from the entrance gate. The end of the spur was across the mainline track and a long siding, but the scarcity of customers along the line meant that loading and unloading of goods would have rarely been impacted by passing trains. No platform or other loading facility seems to have been built for the company. Sterling Lumber Company remained at the site in Los Gatos until 1956, when they sold the property to a local developer who built the Old Town Los Gatos Shopping Center. The lumber yard was converted into a parking lot for this new venture. The railroad tracks were subsequently removed in 1959 for use as additional parking. The site of the Sterling Lumber yard was across the street from the Old Town Los Gatos Shopping Center on University Avenue, between the road and the current parking lot that runs behind North Santa Cruz Avenue. The site is now occupied by the Steamers's Grillhouse, the Gap, Sur la Table, Banana Republic, and Francesca's, all of which were built in the early 2000s. Sanborn Fire Insurance Company maps, 1888-1922. My dad who later became Police Chief, Ralph Phillips worked for Bailey Lumber Company down by where the Toll House is now.